Kotobukiya’s lineup of Bishoujo (Japanese for “beautiful girl”) statues based on Star Wars characters continues with MARA JADE ! Mara's cape is removable, and she comes with her signature purple lightsaber as well as Luke's original lightsaber, as given to her in the novels ! 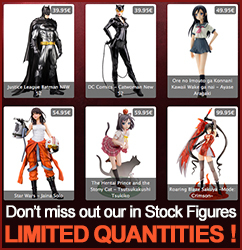 Kotobukiya’s lineup of Bishoujo (Japanese for “beautiful girl”) statues based on Star Wars characters continues after the highly successful Jaina Solo. Coming up next is one of the most popular Expanded Universe characters ever, MARA JADE ! Originally an elite operative for Emperor Palpatine, Mara would learn the ways of the Force from Luke Skywalker to become a Jedi Knight and eventually his wife. She has appeared in dozens of novels, comic books, and video games, and now takes her place as a fantastic Bishoujo statue based on an illustration by master Japanese illustrator Shunya Yamashita. Fiercely independent and confident in her abilities, Mara Jade strides forward into battle with all of her weapons at her disposal. The assassin turned Jedi wears a unique outfit consisting of a skin-tight two-tone blue suit with integrated high-heeled boots and bare arms. Mara is ready for anything with a large blaster in a holster at her waist and a lightsaber held casually in her right hand. She is captured in a walking pose with her other hand held out in front of her, ready to batter her enemies with the Force. Mara shows off the high quality you’ve come to expect from Kotobukiya with a highly detailed sculpt and paint applications, particularly focusing on her beautiful Bishoujo-inspired face and flowing red hair. As an added bonus, you can display the heroine in various ways with or without her removable cape, and she comes with two different lightsabers: her original purple blade and Luke’s original lightsaber given to her in the novels ! Mara Jade stands 23 cm tall (1/7 scale) on a special clear display base that comes with two different film inserts for your choice of presentation. A fantastic addition to any Star Wars or Bishoujo statue collection, Mara looks especially great next to the previously released Jaina Solo statue!